OK, so I couldn't make it to the weekend. I finally got in my newest Gelish color and I am obsessed with it. AMAZING color. The only thing that makes me sad is that the pictures (despite multiple attempts) do NOT do the color justice. It just makes it look very one demensional and flat. It has a tremendous amount of sparkle and is so much brighter in person. I highly recommend it for the Gelish, or even just plain "gel" users. 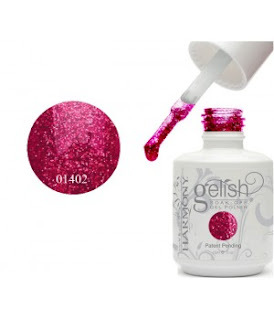 Here is a picture from the gelish Website that shows a sample of the color. So, I used Gelish base coat, applied two coats of the color which is called High Voltage and then a top coat. Once I eliminated the sticky surface, I was ready to add on. I have to say, I like variety but I think I loved the color so mush of the pink that it really can be worn with nothing extra. It is really just amazing on it's own. For me, however, I wanted a little extra something. So, I used Konad Special in black and freehanded french tips. You can easily use a french manicure guide or tape if you needed to right over the top of the Gelish top coat without doing any damage. After it had time to dry, I used Konad's special in white and stamping plate BM03 to make the heart. I love the final product. OK, so several months ago someone turned me on to Pinterest. I became addicted very quickly. I started out pinning the two things I love the most, traveling and food. Little by little, I started to add on additional interests. Animals, of course. 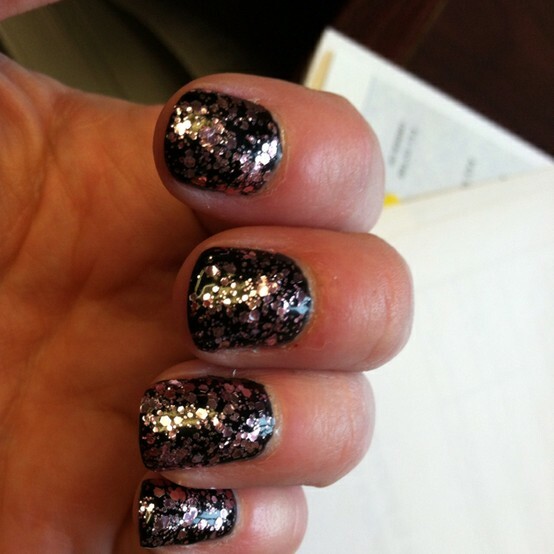 And then a photo of amazing nail design that I found on Chloe's Nails Blog. I have been biting my nails for years. Periodically, I would have acrylic nails put on to prevent me from biting them but I hate the feeling of acrylic nails. Especially when I have to type on a keyboard at work. Also, I hate the damage it does to my natural nails. I went to a salon and the manicurist asked if I would be interested in Shellac. I had never heard of it. Tried it and was sold instantly. At the time, Salons were selling a Shellac manicure for $50. This would be costly over time but after a little research, I found that I could purchase the supplies and the light online (I got mine off E-bay) and could save alot of money. Awesome solution, I could grow my nails out, the feel is very natural and I don't have to paint my nails every few days to keep them looking nice. Then I realized that you can use Shellac (and Gelish which I have also begun using) as a base for hundreds and hundreds of different nail designs using regular polish. The polish sticks and you don't have to worry about your color chipping in a few days. I thought it might be fun to try a blog of my own. I know I will not be close to Chloe's nails because she has perfect hands, nails and is great with the camera but I am going to try and add my ideas. So here is my first attempt (terrible picture, I know). I have used Shellac Black Pool as a base. I do the whole Shellac process which consists of base coat, two color coats and a top coat. I use alcohol to rub off the sticky finish and then paint right over the top with regular polish. 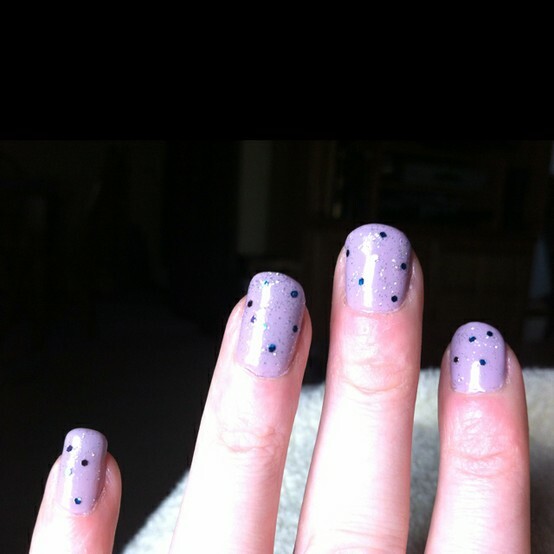 Here I used Essie's A Cut Above which is a clear base filled with large pink metallic pieces. The effect was so cool and the metallic pieces did not flake off like they do when painted on regular nails. In fact, the Shellac started peeling while the Essie stayed on firm. I am finding that the Scrub fresh product sold by CND really helps as a basecoat for the Shellac to keep it from lifting longer. I am amazed how easy it is now to access gel polish. I saw in Walmart the other day at least three different UV lights for sale. Somewhere along the line I had read that it is not possible to blend Shellac products with Gelish by Harmony. I can now say that this is untrue. I bought a few colors of the Gelish to give it a try since I was only familiar with using the Shellac products. And......no problem!!! I used Shellac base and Shellac top coat with Gelish Princess Tiara and it adhered and set fine. I like the Gelish for many reasons, first because there are 75 different colors. And, I don't just mean 75 different variations of pink, red or brown. These are really a wide range of colors and they also have sparkles, which I love. Also, I feel like it goes on smoother and isn't as thick. Now Princess Tiara is a light purple and I have topped it here with Sally Hansen Ice Queen. This is a clear base and it has tiny silver sparkles and also larger metallic pieces in purple and blue. Here is another picture in better light.